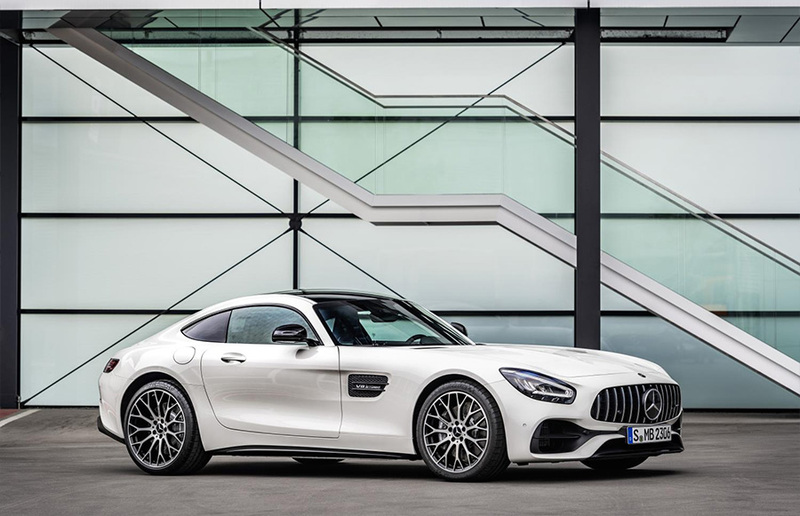 The refreshed AMG GT features new exhaust tailpipes; exterior styling enhancements; new LED High Performance headlamps; and front and rear view camera, with parking sensors and parking assistant. The GT Coupé and Roadster produce 476 hp and 630 Nm of torque. The GT can travel from 0 to 62 mph in 4.0 seconds and has a top speed of 189 mph (188 mph for the GT Roadster). 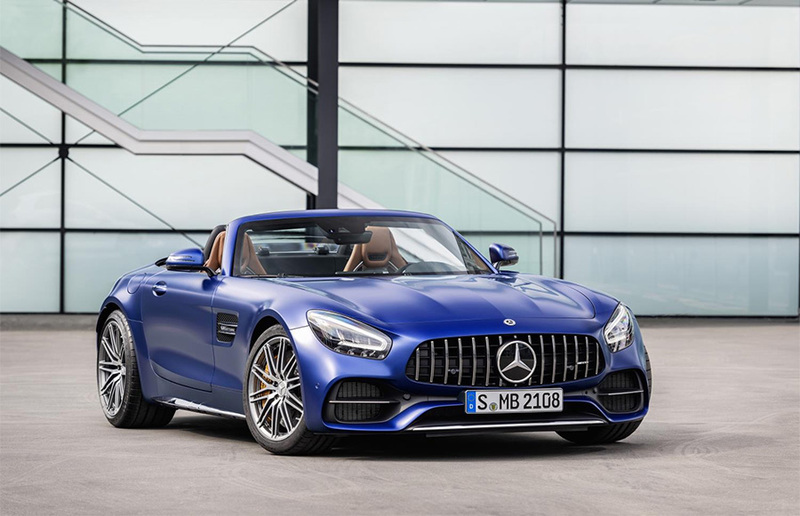 The GT Coupé delivers 23.5-23.0 mpg on the combined cycle and emits 261 g/km of CO2, while the Roadster delivers 23.3-23.0 mpg and emits 262 g/km of CO2. 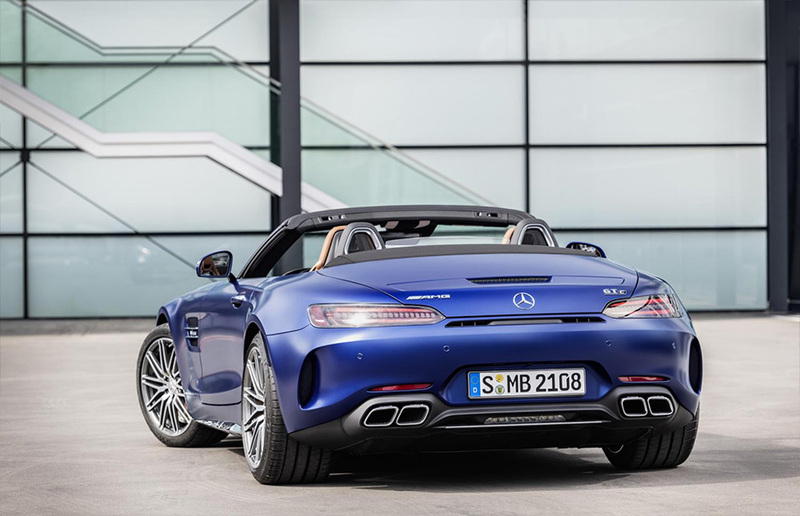 The GT S Coupé and Roadster have an output of 522 hp and 670 Nm of torque. They can reach 62 mph in 3.8 seconds and while the Roadster has a top speed of 191 mph, the Coupé can reach 193 mph. The GT S delivers 23.3-23.0 mpg on the combined cycle in the Coupé (23.2-23.0 mpg in the Roadster) and emits 262 g/km of CO2. The GT C Coupé and Roadster produce 557 hp and 680 Nm of torque, and can travel from 0 to 62 mph in 3.7 seconds. The Coupé has a top speed of 197 mph, while the Roadster can reach 196 mph. The GT C emits 284 g/km of CO2 and the Coupé delivers up to 22.1-21.9 mpg on the combined cycle, while the Roadster delivers 21.9-21.9 mpg. 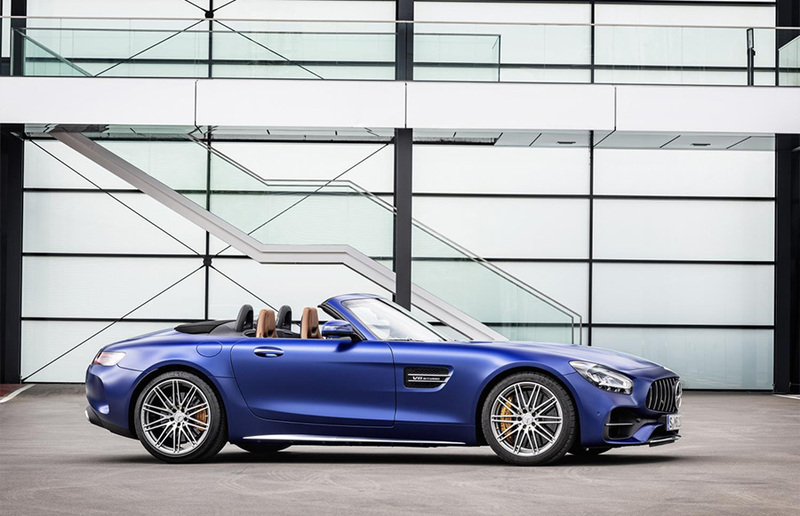 The GT Coupé and Roadster comes as standard with LED High Performance headlamps with Adaptive Highbeam Assist; 12.3-inch digital instrument cluster; electrically extending rear aerofoil; AMG performance steering wheel in nappa leather with touch control buttons; AMG Track Pace; AMG drive unit with centre console in V8 design; 19-inch AMG five-twin-spoke alloy wheels; heated seats; AMG performance exhaust system; Keyless-Go starting function; automatic climate control; silver chrome trim package trim with black nappa leather upholstery; and parking assist. 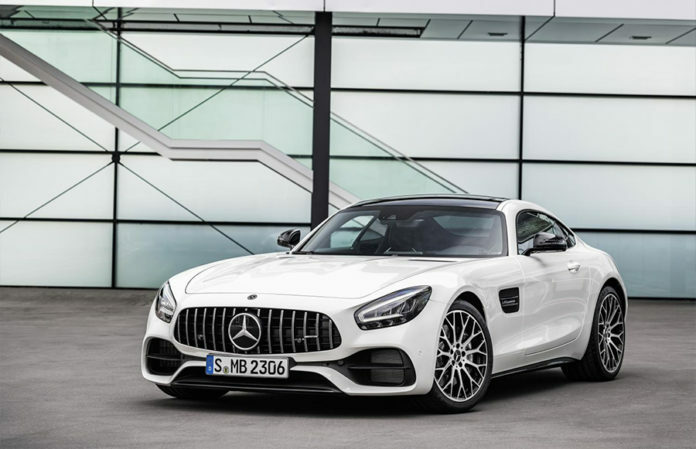 The GT S adds electronically controlled AMG rear axle limited-slip differential lock; 19-inch/20-inch ten-spoke AMG alloy wheels; and AMG Ride Control sports suspension with adjustable damper system. 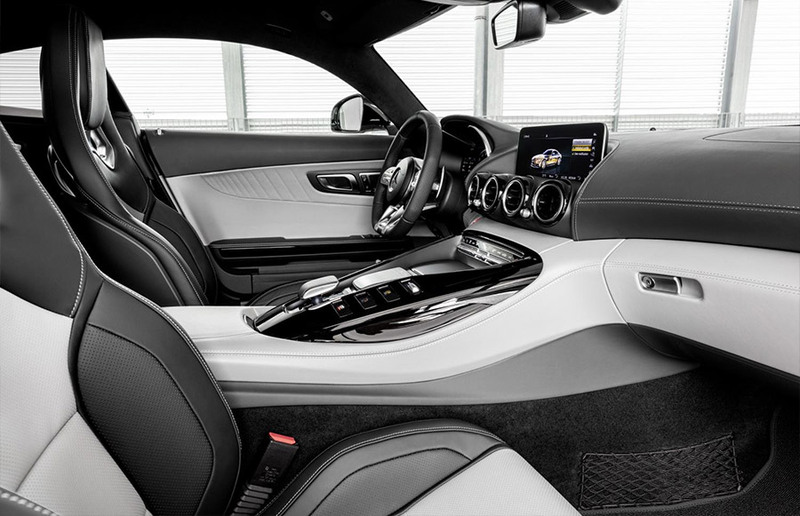 The GT C adds AMG rear axle steering; Keyless-Go package; Mirror package including electrically-folding mirrors and automatically dimming exterior driver’s mirror and rear-view mirror; and Burmester surround sound system. There are a number of option packages available. 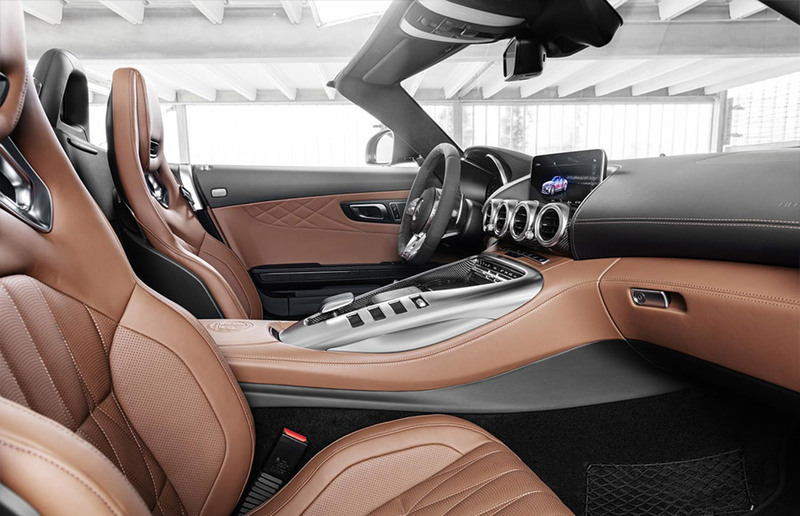 The Premium package – standard on the GT C Coupé and Roadster – costs £3,495 (£2,995 for the Roadster) and includes Keyless-Go package; Mirror package including automatically dimming rear-view mirror and driver’s door mirror and electrically folding exterior mirrors; Burmester surround sound system; Panoramic sunroof (Coupés only); and AMG door sill panels in brushed stainless steel with ‘AMG’ lettering, illuminated in white. The Driving Assistance package is available for £1,695 (only available in conjunction with the Premium package) and comprises Blind Spot Assist; Lane Keeping Assist; Active Distance Assist DISTRONIC; and Pre-Safe anticipatory safety system. 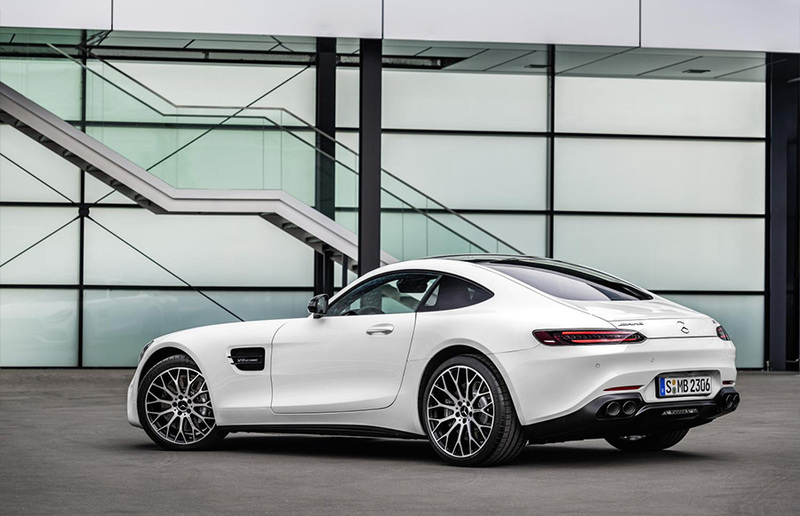 The AMG Carbon Fibre package can be added for £4,495 and includes diffuser in the rear apron in carbon fibre; exterior mirror housings in carbon fibre; air inlet grille in the front apron in high-gloss black; front splitter in carbon fibre; and rear windows with privacy glass (Coupé only). The AMG Chrome package is available for £1,395 and comprises front splitter in silver chrome; diffuser trim in silver chrome; air inlet grille in the front apron in matt black; inserts in the side skirts in silver chrome; rear side window with privacy glass (Coupé only); and trim strip in the diffuser in high-gloss chrome. For £995 the AMG Night package can be added and includes front splitter in high-gloss black; exterior mirror housings in high-gloss black; exhaust tips in black; inserts in side skirts in high-gloss black; and trim strip in the diffuser insert in high-gloss black.